Astitva - Search for an Identity: Why we need permanent seat in Security Council? We are hearing the term UN Security council ever since its inception; the so called elite council of United Nations. After World War II only the winners got admission to this council with veto power. In a simple terms a country which represents some millions of people can veto the decision jointly took by countries which represents billions of people. Truly, one of the most undemocratic system in the world. One of the five countries can stall the any decision which not in her favor. So it is quite natural that other countries start to think about entering into UN SC with veto power. who dont want to enjoy power? 4 countries are the major candidates India, Brazil, Japan, South Africa and Brazil for the position. For a long time these countries are trying hard to get the position. Whenever some country’s head coming to India or Indian premier went abroad the first thing we read in news papers will be that they are supporting our claim to permanent seat in UN SC. But up to now nothing happened, even after the ‘support’ from so many countries. Some supported permanent membership without veto power – some type of second class citizenship. I don’t know why Indians are so fond of this seat. 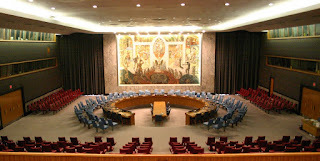 Can you remember the contributions of Security Council to the world? How many times the veto power is used to halt certain developments? And can you justify the concept of veto? There is no doubt that the word of 120mn people should be considered in UN. But at the same time it should also be noted that everyone should have equal power here, otherwise there isn’t any use for UN. If some can took decision for others then what is the need for such an organization? So instead trying to get veto power and permanent membership in UN SC, we should try to remove the veto power from the current members; there is no need for such a discriminatory law. There is no need for asking each and everyone for support to get us permanent membership in UN SC. Either there should not be a permanent security council or the voice of 120mn people should be echoed there. India, South Africa, Japan, Brazil and Germany should put forward a draft to democratize the UN SC and its other functions.